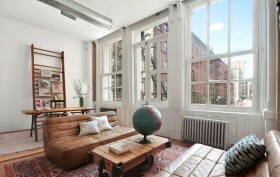 Here’s a stunner of a loft apartment, occupying the full floor of the Soho cooperative 27 Howard Street. 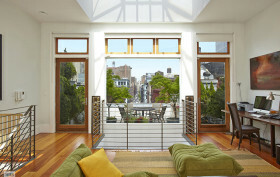 A private key-locked elevator opens into a white, bright living room with high ceilings and brick walls. Plenty of details give the space personality, including a working wood-burning fireplace, walls of windows, and the building’s original 19th-century wainscoting and moldings. On the opposite side of the open living space, there’s a spacious master bedroom (with a tricked-out bathroom), plus a media/guest room in between. The 2,000-square-foot pad has just been listed for $4.25 million.